Engagement and wedding rings come in all styles and it is not until you start thinking of your own very engagement ring do you begin to realise just how much goes into creating a beautifully designed and made ring. The type of diamond or gemstone and which metal to choose are two of the biggest decisions to make but, it is all the smaller details that make up a truly refined and considered piece. One of the most important parts of a design is the finish. When we think of engagement and wedding rings we think of dazzling diamonds set into highly polished metal. This is stunning, luxurious and classic – all at the same time. But a highly polished ring with that perfect smooth, mirror finish is not for everyone. Some love a little texture, a little more depth and detail. This is particularly true for wedding rings, and in particular guys wedding rings. There are many guys who are not particularly fussed on the golden high polished look, instead preferring a design that looks a little more masculine. For guys, or girls for that matter, that fit into this category a hammer finish might just be the perfect ring for you. Hammer finishes create a lovely textured / beaten look and depending on the hammer and the method used in application, different looks can be achieved. One of the most appealing things (particularly for those that work with their hands) about a hammer / beaten ring is that over time your ring will continue to wear, adding to the textured / rough look. Beautiful mill grain and hand engraved detailing. Heavy Hammer tone guys wedding rings. 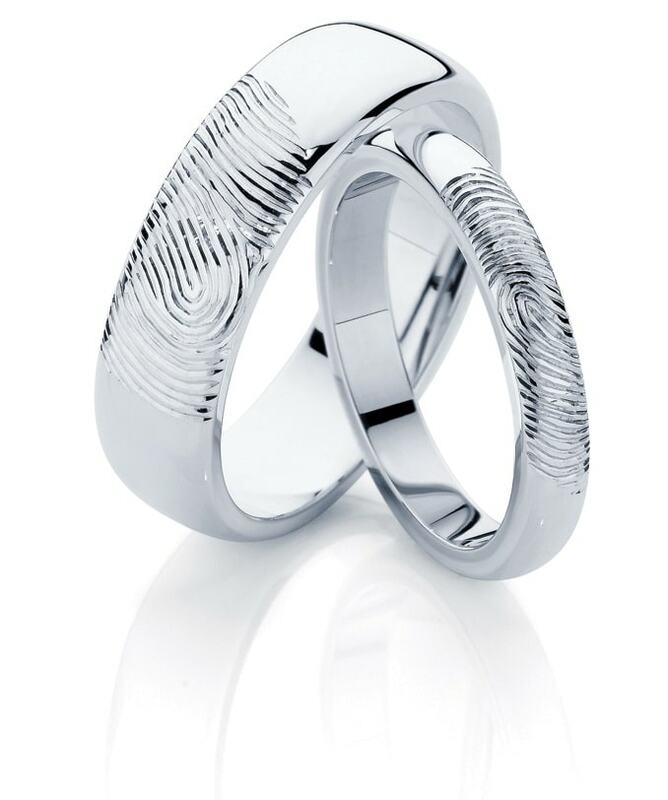 Beautiful “His & Her’s” matching hand engraved ‘Fingerprint’ rings. The ‘Inscription’, a classic hand engraved wedding ring.